The freeway corridor would start in Savannah at the divering diamond interchange between Georgia 21 and Interstate 95. Interstate 3 would follow Georgia 21 northwest from I-95 past Springfield to the Sylvania Bypass and then onto U.S. 301 north. The freeway would depart U.S. 301 at Georgia 24, then continue northwest via Georgia 24 to U.S. 25 Bypass at Waynesboro. 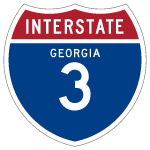 I-3 would then follow U.S. 25 north to Interstate 520, then overlay I-520 to the west of Augusta and pass by proposed Interstate 14. North of I-20, I-3 would follow Georgia 104 north to Georgia 47 at Leah, then take Georgia 79 from Lincolnton north to Georgia 72 east of Elberton. Interstate 3 would head west to Elberton via Georgia 72, then continue northwest via Georgia 77 to Hartwell. After passing Interstate 85, I-3 would take over Georgia 17 northwest to Toccoa, Clarkesville and Hiawassee. North from Hiawassee, Interstate 3 would leave Georgia and enter North Carolina, following Georgia 17 and North Carolina 69 north to U.S. 64 west to Murphy. At Murphy, the freeway would accompany U.S. 19-129 north and U.S. 74 east via an existing expressway to Topton, then head north along U.S. 129 to the western edge of Great Smoky Mountains National Park and onward into Tennessee. Once in Tennessee, I-3 would overtake U.S. 129 north through Maryville and Alcoa, then pick up Interstate 140 north to meet I-40/75 just west of Knoxville. This interchange would serve as the northern terminus. Interstate 3 is a somewhat disputed designation for this route because it does not fit into the grid pattern of U.S. Interstate highways. Lower, odd-numbered, north-south routes exist in the West. 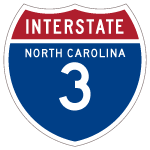 However, since there are no easily identifiable available numbers, Interstate 3 was proposed. To require a study and report regarding the construction and designation of a new interstate from Savannah, Georgia to Knoxville, Tennessee.” This act is known as the “Interstate 3/3rd Infantry Division Highway Initiation Act of 2004.
which is in the strategic defense interest of the Nation. East Georgia, Western North Carolina, and the Great Smoky Mountains region of Tennessee are underserved by north-south interstate highways, and [these regions] would benefit economically and through increased public safety by establishment of an interstate highway. The bill was introduced in the House of Representatives by six members of Georgia’s delegation in late July; the legislation was written by Representative Burns. Companion legislation for Interstates 14 and 3 was filed in the Senate by Georgia Democrat Zell Miller and Georgia Republican Saxby Chambliss.1 The bill is assigned the designation H.R. 4925 and was introduced on July 22, 2004.6 The bill requires the Secretary of Transportation to study the two proposed Interstate routes and present options for construction to Congress by December 31, 2004. On November 2, 2004, Representative Max Burns was defeated by Democrat John Barrow. Due to the extensive, bipartisan support of the freeway, it was thought that new Representative Barrow was likely to lobby just as hard for the road as Burns did. Changes to the corridor were possible, especially since Barrow was from Sylvania in Screven County (along the proposed I-3) and Barrow is from Athens, which is not along the originally envisioned Interstate 3 corridor. Athens does not currently have a main interstate link through it, although U.S. 78 passes through the city. Georgia 316 is a four-lane parkway from Interstate 85 in Gwinnett County near Atlanta.3 As of March 2004, plans called for the conversion of Georgia 316 into an upgraded toll freeway complete with interchanges and HOV lanes.5 Some at-grade intersections along Georgia 316 were replaced with interchanges over the ensuing time period, but as of 2018, the bulk of the route remains an at-grade highway. SEC. 1927. 14TH AMENDMENT HIGHWAY AND 3RD INFANTRY DIVISION HIGHWAY. carry out a study and submit to the appropriate committees of Congress a report that describes the steps and estimated funding necessary to designate and construct a route for the 3rd Infantry Division Highway, extending from Savannah, Georgia, to Knoxville, Tennessee, by way of Augusta, Georgia (formerly the Savannah River Parkway in the State of Georgia). Completion of the route would be costly. It was anticipated that Congressional support would bring needed funding to the project. The Savannah River Parkway (Georgia 555 and Georgia 565), which follows the Interstate 3 corridor between Savannah and Augusta, was mostly upgraded to expressway standards. Further upgrades of the corridor to Interstate standards did not take place, and plans for potential I-3 remain unlikely as of 2018. The directional T interchange joining U.S. 129 with I-40/75 was the likely candidate for the north end of Interstate 3. However with costs to construct a freeway corridor through the mountainous terrain of North Carolina and Tennessee, I-3 would likely not extend north of Georgia. Representative Max Burns Official Webpage http://burns.house.gov/html/release.cfm?id=169. “UPDATE: Highway 21 Diverging Diamond Interchange Now Open.” WSAV (Savannah, GA), January 15, 2017. Page updated September 23, 2018.